Up until recently, seismometers have been a strictly Earth-bound devices, diligently tracking each and every change in the Earth’s surface due to earthquakes, volcanic eruptions, and tectonic plates shifting around. For the first time in the history of seismology, a device been able to capture the noise of vibrations caused by an earthquake from space. In 2009, the GOCE satellite was launched into space, marking a new moment in history – a moment where people will be able to check out the infrasound waves that are released from seismic movements in the Earth’s crust. GOCE also happens to be one of the lowest flying satellites being used for monitoring purposes – hovering a mere 270 kilometers above the surface of our planet. 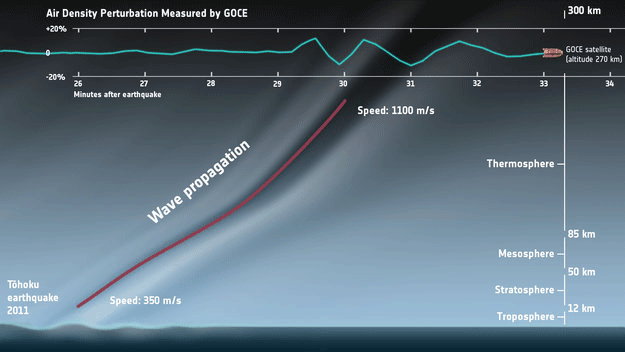 Using a state of the art ion engine to provide carefully measured thrusts to counter the air drag factors that come with being a low-flying satellite, GOCE has been steadily hovering above us for approximate 4 years. The satellite has been monitoring the Earth’s gravity and mapping it all in great detail, all the while dealing with the occasional remnants of wind from the highest scores of the Earth’s atmosphere. Much of the work that GOCE has done was remarkable, however, few things are as remarkable as the evidence that proved that GOCE detected the 2011 earthquake that wreaked havoc in Japan. The evidence was first noted by an international team of scientists spanning multiple agencies who all happened to be examining the evidence sent back by GOCE. The agencies involved in the discovery included the Research Institute of Astrophysics and Planetology from France, CNES, the ESA, the Institute of Earth Physics of Paris, as well as Delft University of Technology. What they realized was that GOCE sensed the displacements caused by the Earth’s atmosphere – just like the way seismometers do on Earth. Needless to say, many seismologists are excited about the news of GOCE’s discovery. The reason why it is so exciting isn’t only because GOCE is quite literally the first seismograph to be usable in space. Up until then, seismologists didn’t have any devices that could compare to their earth-bound counterparts. And yes, seismologists were actually one of the only remaining groups of Earth scientists out there who didn’t have a space version of any of the tools that are commonly used on Earth to further their investigations. GOCE was never really intended to be a space-age seismograph. This means that GOCE has more than one use, and could quite possibly be used to uncover new and exciting clues about the action that happens underneath our feet. This makes it an amazing happenstance discovery that makes the investment into GOCE’s development all the more worth while. Scientists and students can only wonder what new discoveries GOCE has in store for us in the future. However, the only way to find out is to let time reveal all the new details as scientists examine more evidence provided by this one of a kind seismograph. ESA’s GOCE satellite detected sound waves from the massive earthquake that hit Japan on 11 March 2011. At GOCE’s orbital altitude, the concentration of air molecules is very low so weak sound waves coming up from the ground are strongly amplified. Variations in air density owing to the earthquake were measured by GOCE and combined with a numerical model to show the propagation of low frequency infrasound waves. Source: ESA/IRAP/CNES/TU Delft/HTG/Planetary Visions.